Elements Applied: The inner part of the wood is applied in herbal medicine. Lignans; furoguaiaoxidin, furoguaiacidin, furoguaiacin, guaiacin. Other; terpenoids like guaiasaponin, guaiagutin; vanillin. Used For: The herb is used to relieve rheumatic conditions, inflammations; treat constipation, induce perspiration and urination. 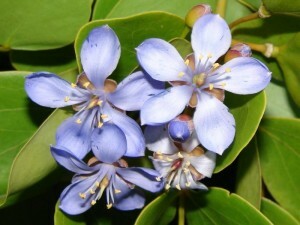 Guaiacum is highly beneficial for treating rheumatic conditions. It is particularly suitable for the cases accompanied by pains and inflammations. It can be applied in rheumatoid arthritis and recurrent rheumatism. The herb is additionally helpful it curing gout, and is also applied to prevent its reappearance. As the plant is very rich in resins, people, suffering from ulcers and gastritis, should be careful when using it. Commonly mixed with: The herb can be combined with Celery Seed, Meadowsweet, and Bogbean. 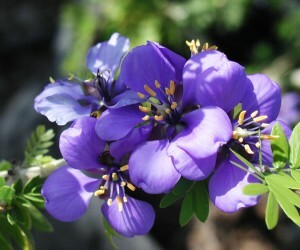 Additional Info: Guaiacum produces the resin which is applied in herbal medicine. The tree is indigenous to northern areas of South America, Central America, Mexico, and the West Indies. Its stem may reach up to 40 feet in height, and features the brownish, hard wood which provides the resin. Preparation and Intake: To prepare a decoction, take a teaspoon of wood extract for a cup of cold water, boil it up and keep on low heat for ten to fifteen minutes. The result is taken thrice per day. In form of tincture the herb is applied at a quantity of 1-2 ml thrice per day. Safety: As the plant is characterized by rich resin concentration, it should be taken with extreme care by people suffering from ulcers and gastritis. There is no further data concerning the herb’s safety level. It is possible that the plant interacts with the medicine you use. Speak to your health-care provider before using the remedy.